Iran hates Jews. Germans killed millions of Jews. Surely this is the business agreement made in Hell. The controversies over U.S. Civil War statues of Confederate leaders and plans to refashion the Jefferson and Washington memorials to reflect ownership of slaves, remind me of how soon some folks forget and how some never do. “Big Marty” of his era! 18th century New England, for example, had tens of thousands of slaves – nearly all American Indians, yet native-owned casinos now dot the northeast states, many by rivers and lakes with tribal names on land stolen by broken treaties with our government. For many reasons, our native residents are not in constant protest, or at least nothing is covered by the mass media. Where are the Trail of Tears protests against Martin Van Buren and Andrew Jackson. A fair poll would show most Americans don’t know, or care, who Martin was, let alone what he did. Jackson is usually remembered for winning the Battle of New Orleans. but few accounts mention he was pilloried for insisting that his White and Black troops receive exactly the same pay and benefits. While many of us belong to groups oppressed in the past, there is only one group that saw millions of civilians murdered in the past century, because of their religion or genetic inheritance. Adolf Hitler’s program recognized two, not one, enemies deserving extinction. Anyone who practiced the Jewish religion, regardless of ancestry. Anyone who was descended from Jews, regardless of their religion. Millions of Jews became slaves because of German national policy. It was not a north and south, where one could hide. Jews were marked for slavery, then extermination, regardless of where they lived in Germany or its conquered lands. No American President ever received as high a percentage of support as Hitler before and during World War 2, making nearly every German complicit. 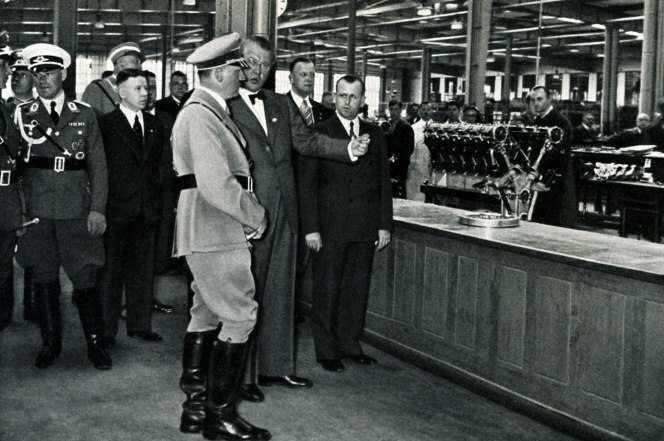 Industrialists poured money into the Nazi party, then made fortunes making munitions. In 1934, with many of the above projects still in development or early stages of production, Adolf Hitler became involved, ordering the production of a basic vehicle capable of transporting two adults and three children at 100 km/h (62 mph). He wanted his German citizens to have the same access to a car as the Americans. The “People’s Car” would be available to citizens of the Third Reich through a savings plan at 990 Reichsmark ($396 in 1930s U.S. dollars)—about the price of a small motorcycle (the average income being around 32 RM a week). Do American Jews drive a Volkswagen? Yes, even though it makes no sense to anyone who believes Never Again. And don’t forget Hitler’s personal favorite – slave-built Mercedes. Or BMW, and its workforce of Jewish slaves, fresh from the concentration camps. Today, there are few organized hate groups openly urging murder of Jews. That role of public hate has been adopted by Iran – Death to Israel, Death to America. An engineering subsidiary of German car giant Volkswagen has announced that it is restarting its operations in Iran, official Iranian media outlets reported on Sunday. Volkswagen itself has also re-entered the Iranian market. In July, the company said it would export its Tiguan and Passat brand models to Iran. Haters of Jews will once again be driving the People’s Car. After Barack Obama’s lifting of sanctions on Tehran regime following the 2015 nuclear deal, German exports to Iran rose to $1.3 billion in the first six months alone. MAN has acquired the plant in Iran to manufacture turbo machinery, which converts the energy from fluids into mechanical energy. Other major German concerns in Iran include such well-known names as Krupp, Siemens, and Mercedes. During World War II, 40 percent of Germany’s tanks were produced at the MAN works in Nuremberg. Meanwhile, back in the world of worrying about atomic weapons, Iran announced that it could reopen its 20 percent uranium enrichment program in five days, not the several months so-called warning time, promised last year by then Secretary of State John Kerry. It was not reported by the Iranians how they have accomplished this dramatic change for the worse, and what foreign companies and technology contributed to speeding up the nuclear threat from the bearded madmen of modern Persia.